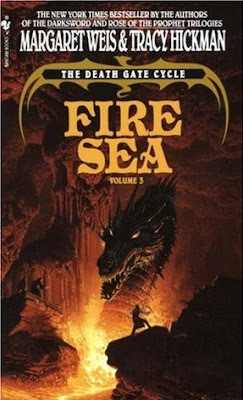 Fire Sea is a 1991 fantasy novel by Margaret Weis and Tracy Hickman, the third in the seven-volume Death Gate Cycle. Here, Haplo travels to the subterranean world of Abarrach, a dying realm in which the Sartan remnant has turned to the forbidden art of necromancy. This is easily the best novel in the series thus far. The authors use their striking atmosphere – a third distinct and captivating world – to tell what is essentially a horror story. It certainly helps that the novel depicts a scenario that’s extremely horrific. Fire Sea also starts to give us some real insight into the questions raised in previous novels, particularly the burning question of what happened to the Sartan on the other worlds. At the same time, the authors introduce compelling new questions while simultaneously ratcheting up the stakes for all concerned. We also get some nice character development for both Haplo and Alfred, with Haplo beginning to make the obvious move from antihero to a man with a conscience, and with Alfred beginning to maybe grow a pair. Both characters can, from time to time, feel like one-note caricatures, so this evolution is welcome, even if their moody self-questioning can be a little much. In short, Fire Sea is a compelling blend of horror and intrigue, one that is full of bold promise for the rest of this series.